Lexus unleashed its 2010 RX 350 and RX 450h to a deafening roar of yawns produced by disaffected onlookers at today's LA Auto Show. Toyota managed to take a boring but tidy SUV and crank the snooze up to 11. The redeeming quality lies in the drivetrains of these suburban shuttles - 275 HP and 295 HP, respectively. The RX 350's 3.5 liter is backed by a traditional 6-speed automatic while the RX 450h's 3.5 liter hybrid powerplant is dancing partners with an electronically controlled CVT. Complete press release below. November 19, 2008 - Los Angeles, CA - Lexus unveiled the all-new, next generation RX 350 and RX 450h hybrid at a press conference today at the Los Angeles Auto Show. The vehicle that pioneered the car-based luxury utility vehicle segment when it launched in 1998, is completely redesigned and will continue to set new benchmarks in areas that have made it the best-selling luxury utility vehicle: innovation, styling, performance, utility and comfort. At the heart of the new RX models are two improved powertrains. Entering its second generation, the RX 450h will feature an enhanced Lexus Hybrid Drive system with a 3.5-liter V6 gas engine that runs on a highly efficient Atkinson cycle. Combined with a new, more efficient inverter, the total system output will be 295 horsepower, 27 more horsepower than the current generation RX hybrid. Another step in the Lexus Hybrid Drive's evolution is the addition of two new systems that improve its efficiency. The first is an exhaust-heat recovery system that reduces engine warm-up time allowing it to stop earlier, more often, and for longer periods. The result is an improvement in both fuel economy and emissions. The second is a cooled exhaust-gas recirculation system that reduces engine pumping losses, which also helps to improve economy. 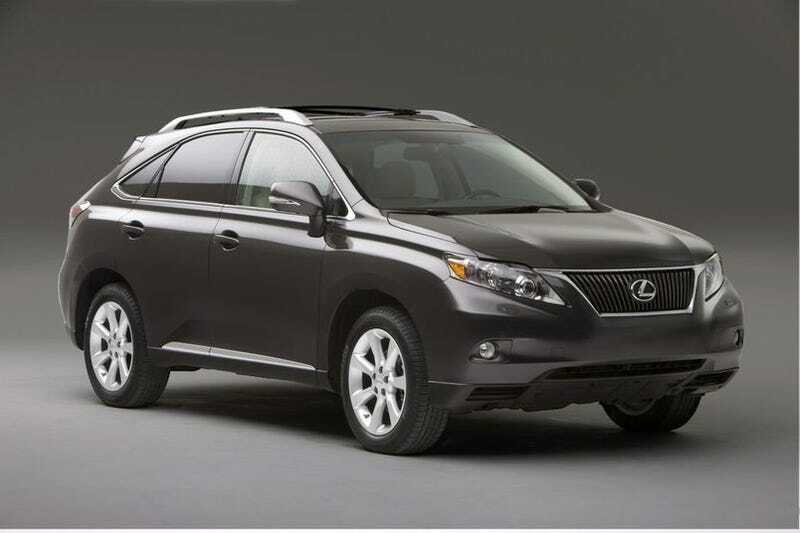 The RX 450h features a front-wheel hybrid drive or an electronically driven, part-time all-wheel-drive (AWD) hybrid drive system, which supplies the rear wheels with the optimal amount of torque as conditions demand. Unlike mechanical AWD systems that reduce fuel efficiency via added weight and friction, the RX 450h's rear-mounted electric motor-generator allows all four wheels to perform regenerative braking, charging the hybrid battery more effectively. The third generation RX 350 will be powered by an improved 275-horsepower, 3.5-liter V6 engine mated to an electrically controlled, sequential-shift six-speed transaxle. The all-wheel-drive version will feature an Active Torque Control AWD system that optimizes torque depending on driving conditions, resulting in improved efficiency and performance. Both RX models feature a new, uniquely designed double-wishbone rear suspension that helps provide exceptional agility and control. Its distinctive design also allows for five percent more cargo volume and easier loading. To complement the new rear suspension and provide excellent dexterity and ride comfort, the front McPherson strut geometry was optimized. The all-new RX models possess a number of Lexus-first technologies that enhance the ownership experience. An available Hard Disk Drive (HDD) navigation system has an all-new "Remote Touch" controller that is both intuitive and ergonomic. Positioned on the center console, Remote Touch is as natural to the driver's hand as a computer mouse. It can also be customized to the desired level of haptic feedback. While RX will feature voice recognition as standard, the new navigation system will also include a new casual language voice-recognition system that acknowledges conversational commands. Standard XM® satellite-radio capability (requires subscription) is joined by XM NavTraffic and new NavWeather features. The spacious five-passenger interior includes a new, thoughtfully constructed "dual-zone cockpit" design. This intuitive layout helps the driver navigate the advanced interior of the new RX, which features two distinct yet integrated zones: a "display zone" and an "operation zone." The "display zone" assists the driver via an eight-inch, navigation display that is set back in the dash for improved visibility. A white Organic LED multi-informational display ensures exceptional readability from a wide angle. An optional Heads-up Display reduces the need for excessive eye movement, and the use of high-intensity LEDs make the display bright enough to be read in direct sunlight. The "operation zone" provides access and control to a large range of information through the available "Remote Touch" navigation controller and the steering-wheel-mounted multi-information switch. The exterior of the all-new RX has a strong stance and powerful new body design with the goal of enhancing comfort and maneuverability. The inverted-trapezoid design in the front and the horizontally integrated rear are incorporated together via a pronounced shoulder along the RX's profile. Stylish molding around the side windows and at the base of the doors provides low-profile strength. Standard 18-inch aluminum-alloy wheels complement the exterior with a strong, sporty look, with optional 19-inch aluminum-alloy wheels providing another styling cue. While it has increased in nearly every dimension, overall aerodynamic advancement was aided by a specially designed undertray, resulting in a segment-topping 0.32 coefficient of drag (Cd). The RX 450h hybrid will have its own unique styling features, including an exclusive grille, hybrid badging including blue-trimmed Lexus logos, unique front bumper, a special 19-inch optional wheel design, blue-tinted headlamps and taillamps, and optional LED headlamps. The new RX is available with a selection of luxury and sport option packages, which include features like Lexus' exclusive Mark Levinson® Surround Sound system, a dual-screen rear-seat entertainment system, dynamic radar cruise control, and a Sports Package featuring a sport-tuned suspension. The all-new RX will offer a wide-angle side view monitor. With a camera located under the passenger side-view mirror, the driver can check hard-to-view areas on the passenger side of the vehicle by simply selecting a button on the navigation screen or the steering wheel and view the camera image on the navigation screen. True to its heritage, the RX's active and passive safety systems continue to be among the vehicle's most impressive features. Lexus' available Vehicle Dynamics Integrated Management (VDIM) seamlessly integrates individual systems like Vehicle Stability Control (VSC), Anti-lock Braking System (ABS), Hill Assist Control (HAC) and Traction Control (TRAC). It operates in a smooth proactive way via throttle, steering and braking to help prevent skids while cornering before the vehicle reaches its operating limits on slippery roads or other challenging conditions. The available Pre-Collision System (PCS) relies on millimeter-wave radar technology to recognize a possible frontal collision and primes the brake assist and retracts the driver's and front passenger's seat-belt in anticipation of the crash. An intelligent Adaptive Front-lighting System (AFS) is available with HID low- and high-beam headlamps on both models, while the RX 450h also offers the AFS with LED low-beam and Halogen high-beam headlamps. Both anticipate the vehicle's location based on vehicle speed and steering angle, swiveling the front headlamps into the turn. An optional new automatic high-beam system detects light from oncoming vehicles, preceding vehicles or ambient sources and automatically switches from high to low beams. Passive safety features include a class-leading 10 standard airbags on the new RX, including dual-stage driver and front-passenger airbags (including the Lexus exclusive twin-chamber front-passenger airbag), driver and front-passenger knee airbags, front and rear seat-mounted side airbags, and side-curtain airbags. It is also equipped with Lexus' front-seat active headrests, designed to help reduce a possible whiplash injury when in certain lower speed collisions from the rear. The all-new 2010 RX 350 will go on sale next February, while the 2010 RX 450h will reach dealerships nationwide in the spring.